As you likely know, our more than 259 million members can follow your Company Page on LinkedIn and receive your company’s updates in their homepage feed. What may surprise you is that 70% of your company’s followers are interested in jobs at your company. Think of them as your very own talent network stocked with passive candidates. But then what? Simply sharing your open reqs won’t cut it. To help you convert your company’s followers from warm prospects to great hires, we’ve developed a new feature in LinkedIn Recruiter that’s free for all Recruiter users: Talent Updates. It borrows a play from the hottest trend in marketing: content marketing. Talent Updates lets you to share status updates – everything from recruiting events to company blog posts to employee videos – with your company’s followers, right from your Recruiter seat. 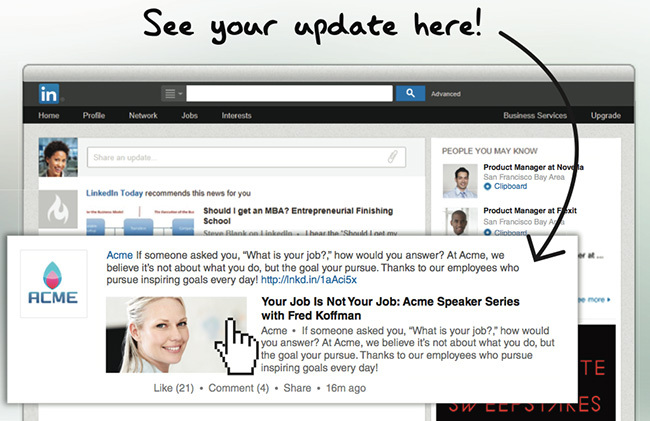 This means the next time they visit LinkedIn, they’ll see your company’s updates in their homepage feed, in their mobile feed and on your Company Page. The updates they like, share or comment on will be shared with their connections, helping extend their visibility. 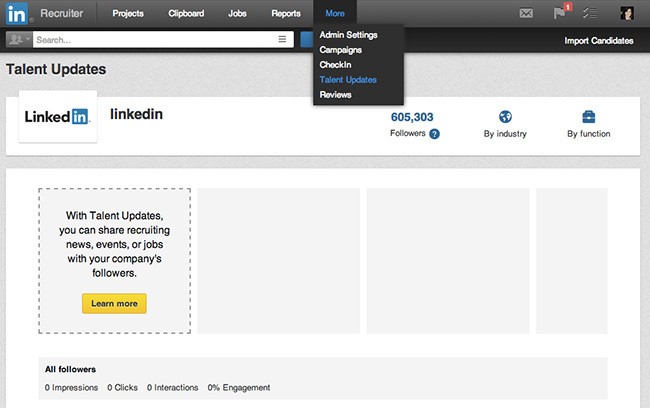 Plus, you’ll be able to see which followers (as well as their connections) like, share or comment on your updates. You can then add them to your pipeline and/or contact them in more meaningful ways than “Hey, interested in a job,” which increases the likelihood of a response and hire. To ensure your team remains coordinated, your LinkedIn Company Page administrator must grant access to each Recruiter user who wants to use Talent Updates. To identify your Company Page administrator and request access, simply login to Recruiter, scroll over “More” at the top of the page, click “Talent Updates,” click “Learn More” highlighted in yellow and then click “Request Access” highlighted in yellow.